Jake Ward’s Christmas Day may be lunch with a few people, a cruise around the island, and a surf. The Christ Church Grammar School old boy and former Claremont resident will be on Vanuatu, not Rottnest, and it will be his first Christmas in the Pacific country. Jake is Oxfam’s water, sanitation and hygiene program team manager in Vanuatu, and has been based in Port Vila since Tropical Cyclone Pam ripped through the islands in March last year. “Last Christmas we had a mate’s wedding in New Zealand,” Jake (33) said. Jake worked for Oxfam in the Solomon Islands and was in Indonesia with his wife when Pam hit. The category 5 cyclone flattened thousands of homes, leaving tens of thousands homeless, and destroyed most of the islands’ food and water supplies. Jake led Oxfam’s immediate humanitarian response to the disaster, which involved distributing emergency relief kits for months. “The effect of the cyclone was exacerbated by drought, which is slowly coming to an end,” he said. 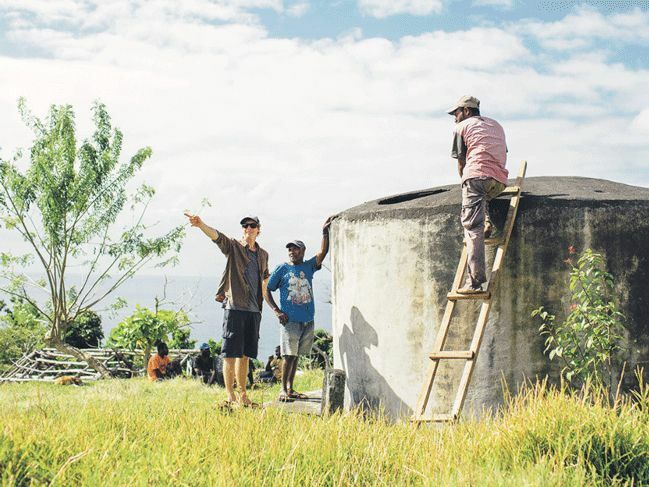 The staff and volunteers work on community water, sanitation and hygiene projects in rural areas of Shefa province on Efate island, where the capital, Port Vila, is, as well as rehabilitating damaged buildings on Tanna, Malekula and Epi islands. Jake also liaises with the Vanuatu government and other agencies and organisations to be ready should another cyclone hit. “My job is also to work myself out of a job,” he said.